HealthOffice® Anywhere applications are provided as part of Healthmaster&apos;s hosted HealthOffice® Anywhere Web Services and are used throughout the school day to properly schedule, control, document and report detailed information about every student encounter with a healthcare professional. HealthOffice® Anywhere contains state-of-the-art documenting ability in accordance with the policies and procedures of each of the respective healthcare professions and district protocols. HealthOffice® Anywhere also provides the ability to document using district-created templates ensuring consistent and accurate documentation across disciplines. HealthOffice® Anywhere applications provide scheduling, documenting, reporting and compliance functionality that equal or exceed all requirements of local, state and federal guidelines in a single, easy to use program and contain all of the components every school district must have in order to be accurate, compliant, secure, accountable and fiscally sound. HealthOffice® Anywhere is IDEA, FERPA and HIPAA Compliant. HealthOffice® Anywhere contains user-specific dashboards allowing professionals to see their daily schedules and other important information at a glance. 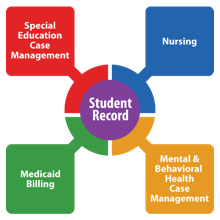 All nursing services, special education therapy sessions and services, mental & behavioral services, testing and therapies, medical problems, diagnosis, scheduled or unscheduled encounters, medication dispensing, as well as all necessary Medicaid or commercial insurance billing information are all entered and can be seen at a glance by an authorized user. Group or individual encounters, multiple types of notes, form and referral letters, health care plans, IEPs, student demographics, contact information, medical alerts, detailed immunization history (including evaluation of each vaccine by dose in accordance with your state&apos;s criteria) and numerous other features provide all of the features and functionality needed by the healthcare professional to perform all of the scheduling, documentation and reporting required by her or his job in a secure and professional manner in one integrated program.